William and Lawrence Bragg in Physics in 1915 for analysis of crystal structure by X’rays. Howard Florey in Medicine in 1945 for developing penicillin, the first antibiotic. Sir MacFarlane Burnet in Medicine in 1960 for the discovery of acquired immunological tolerance. Sir John Carew Eccles in Medicine in 1963 for the discovery of the chemical nature of nerve synaptic transmission. Patrick White in Literature in 1973 for epic and psychological narrative art. Professor Peter Doherty in Medicine in 1996 for work in cell mediated immunity. He showed how killer T cells recognize and destroy viruses. of the causative agent of gastritis and peptic ulcer disease, the bacterium Helicobacter pylori. Elizabeth Blackburn in Medicine in 2009 for showing how chromosomes and the genome are protected from damaged by telomere sequences at the end of chromosomes, and by the enzyme telomerase. Brian Schmidt in Physics in 2011 for discovery of the accelerating expansion of the Universe. Two other Australians have won Nobel Prizes but conducted their work overseas, Alesksandr Prokhorov, and Bernard Katz. We can be justly proud of the standard of Australian scholarship and research, and of the men and women who achieved so much. 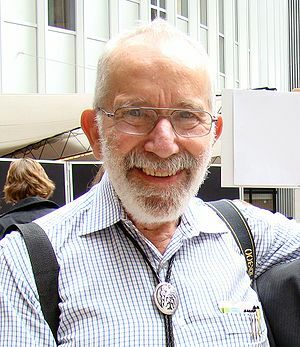 I have added a photograph of Dr Robin Warren an Adelaide medical graduate who was in my year. This entry was posted in Uncategorized and tagged . Science, Nobel Prize. Bookmark the permalink.